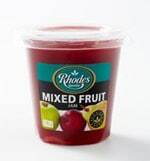 Rhodes Food Group, which has launched several interesting packaing innovations in recent years, has introduced a convenient plastic packaging option for its jam products. The innovative 290g jam cup is the first of its kind in South Africa – and Rhodes believies consumers will appreciate its quality, value for money offer via smaller portion size, as well as its resealable, transparent design. The packaging, which is 100% recyclable, can be stored in the fridge and has a Snap Cap for lasting freshness. The package is available in two popular Choice Grade varieties, Smooth Apricot and Mixed Fruit. It is well-priced for the target mass market, with a recommended RSP of R9.99, and is available at all major retailers and wholesalers.